Aim is to make the best 5 card hand out of 9 cards, 4 dealt to the player and 5 shared by all players. Omaha is a popular poker game that is played in a similar structure as Texas Holdem. It is usually the second game that players learn after they have become comfortable with Texas Holdem and it is a logical transition due to it being so related and a game from the same family of games. Players seem to like Omaha due to the fact that it promotes more action. As you will see in the structure it is played there can be a lot more opportunities for players to make good hands due to the increased number of cards and this can encourage players to stay in the hand rather than fold, leading to some nice big pots! Omaha can be played for a wide variety of stakes and is most commonly played in Pot Limit format but can also be found in No Limit or Limit formats. For more detail on limits and how this affects the betting rules please read our guide to Poker Stakes & Betting Limits. 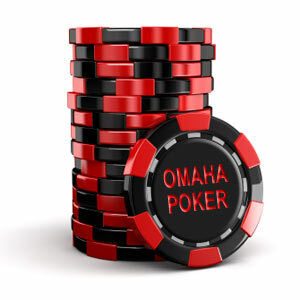 So… How do you play Omaha Poker? The big difference to Texas Holdem is that instead of receiving two hole cards, each player receives four hole cards face down. Just like Texas Holdem during each hand there will be five community cards that will be dealt face up on the table and shared amongst all the players (commonly referred to as the “board”). The player with the best 5 card hand from the poker hand rankings using two hole cards and three community cards. A lot of novice players make the easy mistake of only using one hole card to make up their best hand when they must use two. It is advisable for new players to the game to play a few practice tables or low stakes tables before putting any larger money forward until they get used to this basic principle of Omaha. A Omaha poker hand commences with the placement of the “Dealer Button”. At the end of each hand the dealer button moves along one position to the next player on the table in a clockwise rotation ready for the next hand to start. As with Texas Holdem the two players to the left of the dealer button have to put forward a ‘blind’ bet. This means they have to put a bet into the pot before the cards are even dealt and this ensures that there are is something guaranteed to be won each hand. Forced bets that the two players to the left of the dealer must place. They are called “Blind” because the bets are committed into the pot before the player has been dealt any cards. The “Blinds” as they are commonly referred to ensure that there are chips available to be won on every hand and prevents players from just sitting there waiting for the best hands without losing any chips. 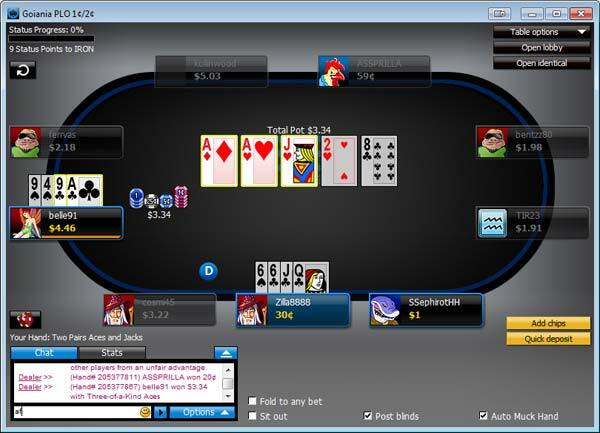 The player to the immediate left of the dealer button puts in the “small blind” and the player to his left must put in the “big blind”. The big blind amount is usually double the amount of the small blind. The size of the blinds are determined by the stakes that are being played. The stakes at a table will be referred to with two numbers, for example $0.01 / $0.02. In this example the small blind would be $0.01 and the big blind would be ….. you guessed it ….. $0.02. Everyone will take it in turns to put the blinds into the pot as the dealer button moves onto the next player at the end of each hand and works it’s way around the table in order. Now the hand has been set up by the dealer button being allocated in front of a player and the two players to his left placing their blinds into the pot then it is time for the cards to be dealt. The dealer will deal first to the player to the left of the dealer button which is the small blind. The last player to be dealt a card will always be the player with the dealer button. The dealer will deal each player 4 cards face down. Only the player that the cards are dealt to can see those cards and know what they are. The cards dealt to a player are called his or her “hole cards”. Once each player has received their 4 hole cards the first round of betting will commence. The action will start with the player to the left of the big blind. 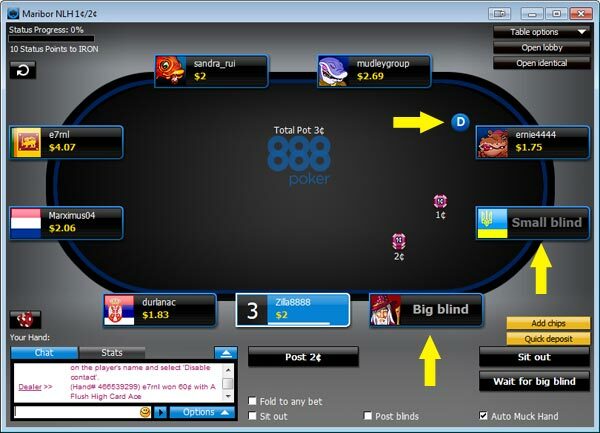 Usually the player to the left of the dealer button (the small blind) is the first person to act, but in this case both the small and big blinds have already placed a blind bet into the pot so they have effectively already acted and so we jump to next player to the left of the big blind. Each player will have three options and will base this decision on the four cards they have just been dealt. “Fold” your cards – to throw away the hand and take no further part in the hand.You will be out of play until the next hand is dealt. “Call” the current bet – to match the amount of the big blind or the amount some one acting before you has raised. “Raise” the current bet – to raise the current bet to a higher amount. Once you raise then all other players must put in the increased amount in order to continue in the hand. If nobody raises and players only call the big blind amount then the person in the big blind position will have two options. First they can check which means they do not want to put any further chips into the pot and are happy to continue to the next stage. The second option is to raise themselves and all remaining players left in the hand must then match this amount to continue. Each player will take their turn in deciding how they wish to act until everybody left in the hand has put forward the same amount of chips at which point the hand moves onto Stage 3. A raise must always be at least the size of the previous bet or raise. This doesn’t always mean double the previous bet as a previous raise might be made up of a call + a raise and the minimum would be to match the size of the raise element but as a beginner if you use double as a guide then you won’t be far wrong. This rule does not apply to some one going all in when this amount of chips he has left is not more than double. Once all players remaining in the hand have put an equal amount of chips into the pot in the first round of betting, the dealer will put the first three community cards (known as the “Flop”) face up on the table for all players to see. Community cards (sometimes also called “The Board”) are dealt face up for all players to see in the middle of the table. They are shared cards and all players must use 3 community cards as part of their Omaha hand. Another round of betting will then start. This time the first player to act will be the player immediately to the left of the dealer button (the small blind) and it will continue like this for all other betting rounds from now on. “Check” – no bet has yet been put forward by any player so this is the free option which allows you to continue to play the hand but not place a bet. When a player checks the action is moved onto the next player. If all players decide to check then no more chips are needed to be put in to continue and the hand moves onto the next stage. “Bet” – You can be the first player to place a bet. “Call” – match the current bet to stay in the hand. “Raise” the current bet – You may raise to a higher bet. Once you have raised then any other player who wishes to continue to play the hand must now call your increased bet. “Fold” – you don’t want to call the bet and you fold your hand. You will be out of play until the next hand is dealt. Each player will take their turn in deciding how they wish to act and this carries on until all players who wish to continue in the hand have put in an equal amount. Once the second round of betting has finished the dealer will put the fourth community card (the “Turn” card) face up onto the table and another round of betting will occur following the same format as the second round of betting. The fifth and final community card (the “River”) is then dealt face up on the table and a final round of betting will start. At this point all players will know what their best five card hand will be as there are no more cards left to be dealt. When players have completed the final round of betting and the remaining players have all put in and equal amount of chips, then all remaining players must reveal the two hole cards they wish to use to make their best five card hand. Remember the golden rule when playing Omaha. You must use 2 hole cards of the 4 that you receive and 3 of the 5 community cards that are on the board to make up your hand. 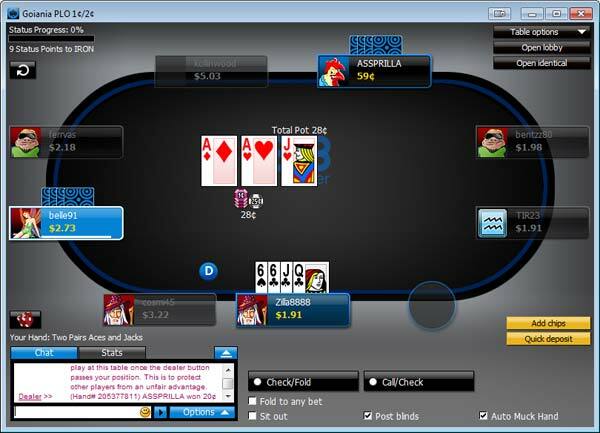 The pot is awarded to the player with the highest 5 card poker hand, and the hand is complete. After the showdown the dealer button is moved along one space to the left and we start again from Stage 1 with the next hand. A player is “all in” when they have put all their remaining chips into the pot and have no further chips to play with. When a player is all in and there is only one other player left in the pot with chips, then it goes straight to the showdown. The four cards from both players are revealed and the rest of the board is dealt out with the winner being awarded the pot. If there are two or more players left in the hand with chips still remaining after some one has gone all in, any further bets by these player cannot be won by the all in player (because he has not matched these bets). These chips go into a side pot and only players who have contributed to the side pot compete to win these chips. If during any of the betting stages a player makes a bet or raise that nobody calls then that player wins the pot there and then. No more cards need to be dealt and it is irrelevant whether that player holds the best hand or not. This is called “winning the pot uncontested”. After this the cards are gathered in and next hand will start. Omaha is a great game to move onto if you have already become comfortable with Texas Holdem. Its similarity means that you will feel at home straight away and the learning curve is not too steep to understand the differences between the two games. Players who want to play Omaha Poker well will find different challenges to that of Texas Holdem. Situations that are good in Texas Holdem can often be risky situations in Omaha with so many more hand combinations possible due to the 4 hole cards held by every player. If you want to learn how to play Omaha then we recommend that you now visit our Play Poker section. There you can select a trusted and recommended online poker site that offers Omaha games to get started playing. Practise is the best way to learn, so get yourself sat down at a low value stakes Omaha table and just follow the stages through above. Take it slow and don’t risk too much money until you are comfortable with the rules and structure of the game. Once you are comfortable then the next stage is for you to learn how to play well and make sure you are a profitable poker player. We have you covered there as well so head on over to our Poker Tips section and start counting the profits – and the best bit is we don’t charge you a commission on your winnings, you get to keep them all!